For over 130 years, Avalon’s hot and cold springs were known as Howard Springs. The land that became Howard Springs is said to have been purchased in 1863 by J.M. Collins, who lived there for one year. It’s not known who claiming ownership would have sold the springs to Collins; as Ellen Klages points out in regard to James Harbin’s “purchase” of Harbin Springs in 1856, early land title was largely a matter of possession. Legal entitlement and recording were in force by 1861, when the Clear Lake district detached from Napa County to become Lake County. 1872, Feb. 29 Proposed Mills Toll Road map shows trail to “Howards Springs” Articles of Incorporation, Lake Co.
Table 1. Time line of Howard Springs property events, mostly from Lake County records. Charles Davenport Cushman was a 49-year old farmer from Massachusetts when he registered to vote on October 30, 1868. His farm took up much of southern Seigler Valley. On December 4, 1869, two months after Cushman’s wife died, James W. Howard paid him $1,500 for 360 acres stretching almost two miles from the southern Seigler Valley northwest far up the mountainside north of Bonanza Springs. As early as 1881 it was erroneously reported that C.W. Howard was the first owner of the springs that came to bear his name. That source -- the first comprehensive “History of Napa and Lake Counties, California” -- has been cited often in the history of Howard Springs, repeating the error. James Washington Howard was a 35-year old mechanic from Indiana in August of 1866, when he registered to vote in Lake County. To solidify his entitlement to Cushman’s Seigler Valley property, he not only had the sale document recorded but also filed homestead and patent claims on the land. His purchase of Cushman’s farm included a house and a building labeled “C.D. Cushman’s Barn,” according to the state township survey of July 7th, 1868; its mapped location corresponds to that of a very old barn on Big Canyon Road today, and they are probably the same building. The Cushman farm abutted the Howard Springs property to the south but didn’t include it; how and from whom James W. Howard purchased the 160 acres containing the springs has not been determined. A fire at the Lake County Courthouse in Lakeport on February 15, 1867, destroyed all the County’s records except for one of the Treasurer’s Books, so perhaps the records of an earlier purchase were destroyed. Howard must have possessed the land by 1872, because the 1872 map filed with the Lake County Recorder for the proposed Mills Toll Road shows an existing trail from Adams Springs around the east side of “Sigler” Mountain, with a short fork “to Howards Springs.” J.M. Collins could have sold the springs property directly to Howard; he continued to reside in Lake County, listing himself as a 45-year old farmer with a 30-year old wife Elizabeth and children William (age 14), Edward (age 12), Robert (age 10), Annie (age 7), and a six-year old daughter who’s name is indistinct, according to the 1880 Middletown Precinct Census. According to a 1959 interview with Hubert Borchelt (probably Hubert Jr.) of Cobb Valley, a Mr. Ely owned the south end of Seigler Valley including what became known as Howard Springs, and J.W. Howard married Ely’s daughter and thereby received the land as a gift. The Mr. Ely was probably Thomas Benjamin Ely, a 41-year old farmer in September of 1877 when he registered to vote in Lake County. No archival sources were found confirming Borchelt’s account. James W. Howard did have a family, listing himself as a 29-year old “stock raiser” in the 1860 Vacaville Township census at the Putah Post Office with a wife Sarah (age 24), two daughters Nancy J. (age 6) and Marian H (age 3), and a four-month old infant. An 1875 map filed in support of a proposed county road from Middletown to Lower Lake via Big Canyon shows only two buildings at “Howard’s Springs.” While commercial development of Lake County’s natural springs proceeded vigorously in the early 1870s, with Victorian spas built around Bartlett Springs, Harbin Springs, Adam Springs, Seigler Springs, and others, Howard Springs was not among them. 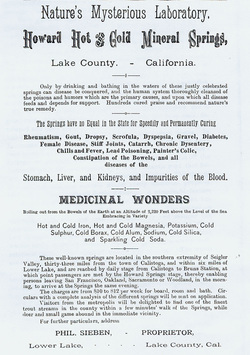 Nonetheless, James W. Howard was advertising the springs by early 1876. One year later, in the county newspaper of April 21, 1877, he described the resort with a “new hotel, newly furnished throughout.” Howard’s spring was initially a place for people to camp, but his modest lodge, cabins, and bathing pools in 1877 still had 100 visitors when visited on horseback by “Scio” and described in The Lake Democrat. The April 21, 1877 advertisement in The Lake Democrat boasted that the new hotel would be kept open summer and winter, “the water proving equally efficacious the year round.” But in early 1878, after operating two full years, James W. Howard sold the resort to August Heisch. August Heisch identified himself as 56 years old in 1878, a mechanic from Germany, when he registered to vote in Lake County. After the sale was recorded, Heisch went on to file a homestead claim on Howard Springs in 1879, and a patent claim in 1881. By August of 1882 he was dead, without a will. Mentioned in court documents disposing of his estate was property accompanying “Heisch’s Springs” including a hotel, barn, cabins, stage coach and two horses, one set of harness, “bar room furniture,” “bed room furniture,” “kitchen furniture,” and a piano, ultimately valued at $4,000. Named as next-of-kin were his widow Carolina (sometimes Caroline) Heisch, aged 61; presumably a daughter of age 30 named Carolina (last name indistinct) Evers of Sacramento, and a daughter aged 16 named Louisa Heisch. Mrs. Heisch advertised again in Granger’s subsequent 1886-1887 directory. But after five years of running Howard Springs by herself, Caroline Heisch signed court documents in October of 1887 yielding her role as executrix of August Heisch’s estate, and sold the property to Philip and Margaretha Sieben. Philip Sieben (also spelled Phillip and Philipp) was a fellow German immigrant, listing himself as a 47-year old hotel keeper when he registered to vote in Lake County on September 4, 1887. His wife Margaretha died March 22, 1888. Philip Sieben advertised the resort eloquently in such outlets as an 1888 book promoting Lake County. The San Francisco Blue Book of 1888-89 (pp. 234) identified Sieben as the proprietor and George Eff as the lessee. But Sieben held the property for only four years, selling it to Charles Louis Adolph Scott on April 30, 1891. Charles L.A. Scott was the third German immigrant in a row to acquire Howard Springs, listing himself as a 52-year old hotel keeper from Putah when he registered to vote in Lake County on September 30, 1892. Howard Springs had just become home to the official Putah Post Office, in 1892, with Scott as postmaster. 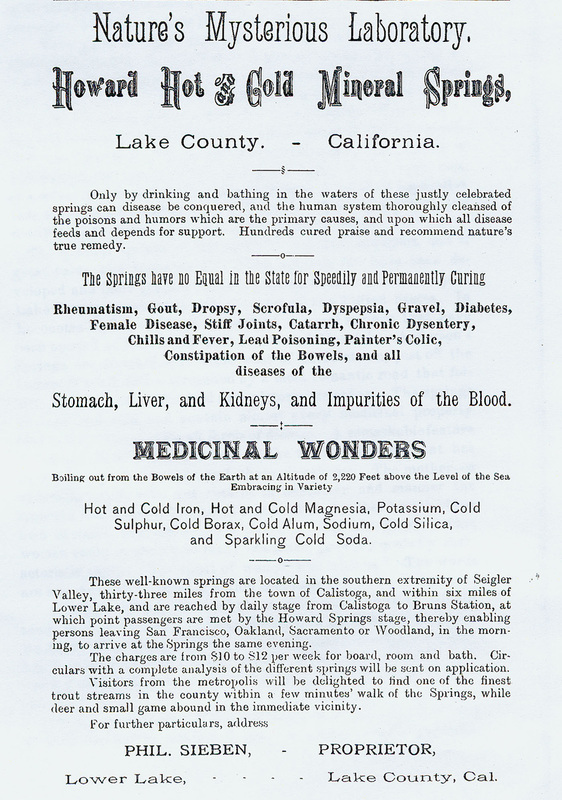 Anderson reported that “the resort is growing every year.” The presence of a U.S. post office likely increased the local prominence of Howard Springs, and the thermal waters were included in an 1894 mineralogical analysis of the region’s springs published in the Twelfth Report of the California State Mineralogist. In 1896 Mrs. R.J. (Lizzie) Beeby purchased Howard Springs from Charles Scott, taking on the role of official Putah postmaster. Three photographs illustrating an advertising brochure show the resort then including an L-shaped lodge (lacking the east wing) and two-story annex, with landscaped springs, small wood-framed bathhouses, and a boardwalk to keep clients above the marshy area near the springs. Already the resort could boast of a “telephone on the premises.” But in two years Mrs. Beeby was filing to protect Howard Springs from her creditors, and after 1898 a gap in the property ownership appears in county records. By then Sunset Magazine recognized Howard Springs as one of Lake County’s “summer resorts,” along with Harbin, Anderson, Adams, Hoberg’s, Astorg, Glenbrook, Bonanza, Seigler, Bartlett, Carlsbad, and Highland Springs, all but Bartlett reached by stage from Calistoga with an overnight stop either at Calistoga or Napa. In 1900 R.F. Dockery, owner of nearby Bonanza Springs, was appointed postmaster at Howard Springs, but he declined the position. After a run of nine years (1892-1900) the official U.S. Putah Post Office at Howard Springs was closed, although the resort continued to cancel mail under the name “Howard Springs” until at least 1904, with official service from Lower Lake.